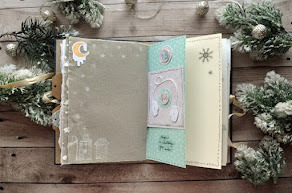 When I saw the new Moon child products I knew that I wanted to make a Pocket letter with them! It is a fun way of showcasing the beautiful cards and papers and also to share with a friends. First I used one of the papers as the backing of my pocket letter. I cut the paper out in 9 pockets, you can see the measurements above. Here is how great the back looks! I didn´t have to add anything more since the paper is so beautiful! For the front I also used a few stickers from this sheet above. Don´t you love all the colors! There are also new pocket cards in the shop and they match perfectly ofcourse. That is what is so great with kits! I also added two of these stamps to the pockets. I used a sheet of white cardstock since I think the stamps show themselves better than directly on the patterned papers. When I had stamped out them I punched the images out and added to the pockets with 3D dots for some dimension. Since there is a whole star theme, I also wanted to make some star confetti to add to one pocket. I thought that Make a wish card fitted perfectly with that. I have this punch that makes 6 little stars at once and I used the strip of paper that was over from me cutting the patterned paper so that the stars would match everything else. And here is the pocket letter all done! I will add my handwritten letter and a few goodies before sending it of to my penpal. She will be so excited to see the beautiful products!